Mozilla plans to release a couple of changes to the Firefox web browser's bookmarking system in upcoming stable channel releases. 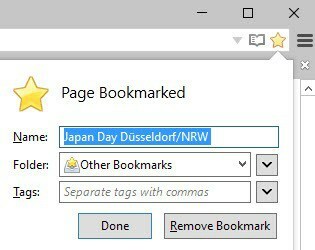 Bookmarks have not received much love in the past couple of years and while they are still an integral part of all web browsers, they work pretty much like they did a decade ago. Some companies try to change layout and presentation of bookmarks but for the most part, they are still just links saved locally that point to web resources. Mozilla plans to make gradual changes to bookmarks in Firefox and release those alongside Firefox 47, 48 and 49 Stable. As is the case with all upcoming feature additions, things may get postponed or even cancelled outright so keep that in mind. If you are using bookmarks regularly, you may have noticed a slight change in Firefox 46 already. When you open the bookmarks library in the browser or a newer version now, the unsorted bookmarks are opened directly instead of the all bookmarks listing. All bookmarks that are not filed into user created folders are filed under unsorted bookmarks by default in Firefox. Starting in Firefox 47, you may notice a change in bookmarking behavior. You know probably that you can click on the bookmark star icon to add a new bookmark to Firefox. This always added the bookmark to the unsorted bookmarks by default and if you wanted to file it in another folder, you had to click on the bookmark star again to display the bookmarks panel which allowed you to do that. This panel opens directly in Firefox 47 and newer versions so that you are saving a click if you save bookmarks to specific folders regularly in Firefox. Starting in Firefox 48, unsorted bookmarks are renamed to other bookmarks instead. Again, a subtle change and nothing major but it may be the better description for the default bookmarks folder. 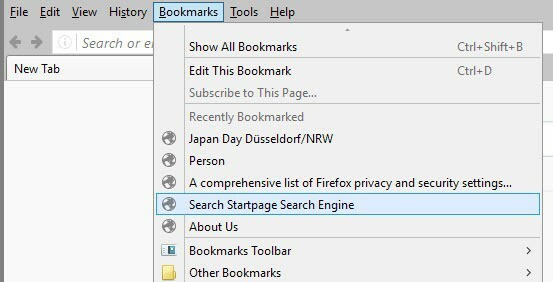 From Firefox 49 on, Firefox users will get a list of the five most recent bookmarks that they have added to the browser when they click on the bookmarks icon or use the bookmarks menu. This functionality is not entirely new as Firefox offers special bookmarks folders already of which one displays the ten most recent bookmarks, but it moves the last five to the main bookmarks listing which improves their visibility. Firefox users who don't want those listed in the main bookmarks listing may right-click when the mouse hovers over the menu to display and select the hide recently bookmarked option to remove these recent entries from it. The recently bookmarked listing replaces the special bookmarks folder on new profiles. These changes are not really major as nothing gets removed but they optimize how you work with bookmarks in the Firefox web browser. You can already test all the changes in the most recent Nightly versions of Firefox. A bookmark feature I’d most like to see added is the option to disable the automatic adding of the “Description” field to new bookmarks. It easily quadruples the size of the places.sqlite and adds tons of unnecessary overhead when parsing the bookmarks toolbar GUI. – description: Search the world’s information, including webpages, images, videos and more. Google has many special features to help you find exactly what you’re looking for. Seriously – does anybody actually use the description field? ever? When you have 10-50 bookmarks, the problem is nonexistant but when you have 500+ bookmarks this becomes a tangible problem. Quadruples? Isn’t your places.sqlite mostly your browsing history? If it isn’t then you’re in the 1%. From your position in that 1% you advocate the removal of features that 99% of users in a different group don’t use. If your profile is set to never remember history or clear history on close (which is probably a lot more than 1% of Firefox users) then the only thing in your places.sqlite is your bookmark information. It’s funny how dumb people assert “the 1%” thing as fact to justify their own biased viewpoints based on their “feelings” as opposed to actual statistics. It is also particularly amusing how you attack my suggestion (which seems to have no purpose other than to troll The entire crux of your comment is based on, ‘it doesn’t affect me and everybody else in my imaginary world so you are wrong’. Very intelligent indeed. He didn’t advocate the removal of anything. He wanted the OPTION to disable the Description field from his personal settings, not remove the field from Firefox entirely. Agreed. The first thing I do with new bookmarks is Ctrl+A the Description field and delete its contents. I imagine some people find that information useful, but I don’t. A simple about:config Boolean like “browser.bookmarks.descriptions” would be handy. Perhaps this could be done with an add-on. The places.sqlite database is already 10,240 KB when it’s “empty” though, so the problem doesn’t really become an issue unless you have a *ludicrous* number of bookmarks or you keep your browsing history for a long time, or both. IIRC the places.sqlite (and similar) is created as a “sparse file” — lotta space reserved internally toward avoiding fragmentation of the file-on-disk as content is added to it. Fragmentation does eventually occur, and for that, a “compact database” operation (performed by ccleaner or other utility app) is helpful. Yes, I do that also. Aside from db bloat, the prefilled content is often redundant, or is UNhelpful (spammy). Is the description field the one hidden below tags? I’ve used Firefox for long time and never seen any description filled there. It’s usually hidden so I never noticed until you say it. No, if you select a bookmark in the Library (Ctrl+Shift+B) and click the More arrow at the bottom, you will often see a description in that area. I use it to add a note that helps categorize a bookmark similar to the Tags feature. But I was doing that long before Tags was even added to Firefox 3.0. They should add functionality of following add-ons, without which bookmark management in Firefox is a JOKE. Thanks for information, didn’t know for these useful add-ons. InstantFox functionality should also be included. Editing and adding (instant) keyword searches should be part of simpler settings within Search section, with an option to sync them with other devices. And not the existing way which requires creating bookmarks. There is an excellent add-on doing it already, called QuickMark, 1 click on the star and you get an elegant full bookmarks menu to chose your folder from. Default is unsorted, pressing esc cancels the operation altogether. Having never been a fan of the standard bookmarks mechanism, I long ago started creating my own custom homepages that are stored locally, and they contain all the links to sites that I plan to visit regularly. When the Firefox window opens, there are all my favorite websites really to be clicked without all the excess navigation required to use standard bookmarking schemes. Of course, I don’t keep thousands or even hundreds of URLs on that page, but once the page has been created, it’s easy enough to add/remove links, as needed. No bookmark backups are required, and I simply keep a backup of the most current homepage readily at hand. This works well for me, but I do understand that it wouldn’t be a viable option for some. Since I have no bookmarks, I’m guessing the proposed changes won’t affect me at all. I’d hardly call what Mozilla has been handing out for the past year or more “love”. At least “Unsorted” showed some character. “Other” means nothing in particular. It’s just a term that all of the “other” browsers use (notably Chrome). I’m sure there are other dial addons out there. What does everyone else use? How impressive! How innovative! Are they going to finally make bookmarked pages visually distinguishable in history? Nope, probably will have to wait until Firefox 698. Maybe. I would love for somebody to code a really robust bookmark manager. I run a small business, and I use Firefox as my main browser. My bookmark tree is essential, and I back it up (along with my entire user profile) using FEBE addon. I have over 1400 bookmarks! Some are duplicates out of necessity. For example, I have many customers with their own web-sites. Also, I have customers that are also vendors we use. When we need office supplies or computer parts, there’s a section of the tree for that, listing the online and retail vendors we use. Sometimes one of those vendors is also a customer, or somebody who works for one of those vendors is a customer and the link is duplicated in another section of the tree, say, under Customer Contacts rather than Vendors – Printer Toner… Etc. The whole mess is organized, but it takes way too much work to keep it that way. For example, we use a password manager and have taken to enclosing bookmark names in brackets to indicate that 1) we have an account with this site, and 2) The password manager should kick-in when you click on this link… For example, in my tree NewEgg.com looks like this: [NewEgg]. Somebody suggested that I just trash the whole idea of organizing in a traditional tree structure and just dump all 1400+ into one big list… Then find and use a really friendly search mechanism. I might try that on a test browser, like Vivaldi. Be interested if y’all have any ideas. Long time ago I discovered add-on “Add bookmark here”, which adds bookmark to bookmark folder you have opened. Since then I never used bookmark star button. Mostly I use Link Stash for bookmarks, but I do like to keep a few mark a few websites in my browsers. If either browser manages to destroy the simplicity of its current bookmarking system, I’ll just quit using them altogether. I wish everything were so simple. I hate the new bookmarking procedure. I LOVED the ultra-quick method of bookmarking a website by simply clicking on the star. I don’t care where the bookmark is actually stored as long as I know that I would eventually find my bookmark somewhere in the future. I LOVED the quickness of bookmarking by simply doing ONE click. Now I have to do a second click to store the bookmark right away with no additional information provided. What I really hate about that change is, that i have no clue about how to restore the old behavior. I wanna stick with ONE CLICK BOOKMARKING. Is there anyone with a helpful idea how to go back to the old bookmarking behavior? Totally agree with Martin (above). I came to this thread and I’ve been looking for a solution too. I was quite happy with a single click on the star and the page is bookmarked. I bookmark many pages and having to click again to hide the dialogue is really annoying. Same here. The old behavior was much better IMO, but guess what– Chrome does it that way, so of course, Firefox has to copy it. I am so tired of Mozilla thinking they need to ape Chrome! If I wanted Chrome, I would be using it. I use FF because it is NOT Chrome. In Firefox 48 (but I suspect this started with version 47) if I click on “Bookmarks, Bookmark This Page” the normal “Page Bookmarked” pop-up shows up. If I then I wait a while without doing anything, the “Page Bookmarked” pop up goes away and the bookmark is automatically added to my bookmarks list. How can I avoid this automatism? In FF 48.0 why does right mouse click no longer work in Bookmarks menu??? No way to delete a bookmark now in the menu.